Other than as a condiment on pizza or a way to ward off vampires, few of us give much thought to onions or garlic. That mindset is changing, however (onion consumption is up 70% over the past 20 years thanks to popularity of onion appetizers) and that's a good thing. These bulb vegetables are super powerhouses of nutrients and other phytochemicals (chemicals believed to offer health benefits but not listed as essential nutrients). Rich in antioxidants (which may prevent cell damage in our body), onions are a good source of chromium, Vitamin C and fiber. There is research to show that onions can reduce our risk of heart disease, lower total cholesterol (while increasing the good HDL cholesterol), improve digestive health, prevent bone loss associated with osteoporosis and prevent some forms of cancer. Onions have also been shown to lower blood sugar for people who are diabetic and help reduce inflammation caused by chronic illnesses such as diabetes, cancer, heart disease and neurological disorders. 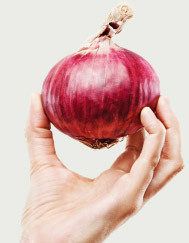 Onion eating tip: If you are concerned about onion breath, opt for cooked onions which leave very little odor. Help may also can come from chewing a few springs of parsely or orange or lemon peel or swooshing your mouth with a cup of lemon juice and water. Praises for the health benefits of garlic are no less impressive than those for onions. The National Cancer Institute and National Institutes of Health have not approved any nutritional supplements for the prevention of cancer, however, they've both recognized garlic as offering potential anticancer properties. Variables still being determined, which may impact garlic's anticancer properties, are the forms of garlic, amount consumed and frequency of consumption. In many of the published studies, it appears that populations who ate the most garlic had the lowest risks of developing several types of cancers. Important garlic cooking tip: Cooking garlic cloves whole, or cooking immediately after chopping or crushing, appears to block garlic's cancer fighting benefits. 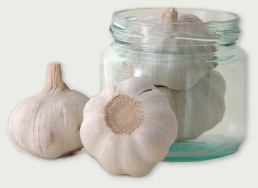 However, allowing crushed or chopped garlic to sit at room temperature for 10-15 minutes results in a chain of chemical reactions that preserves this desirable anticarcinogenic activity. It gives the anticancer compounds a chance to form, according to John A. Milner, chief of the Nutritional Science Research Group at the National Cancer Institute. I read recently that drinking a glass of milk with your garlicky meal will help neutralize the off-putting sulfur compounds of garlic. Perhaps that is true for preventing onion-breath, as well.